A 26-unit affordable rental housing project along the Commercial Drive Corridor in East Vancouver officially opened yesterday. 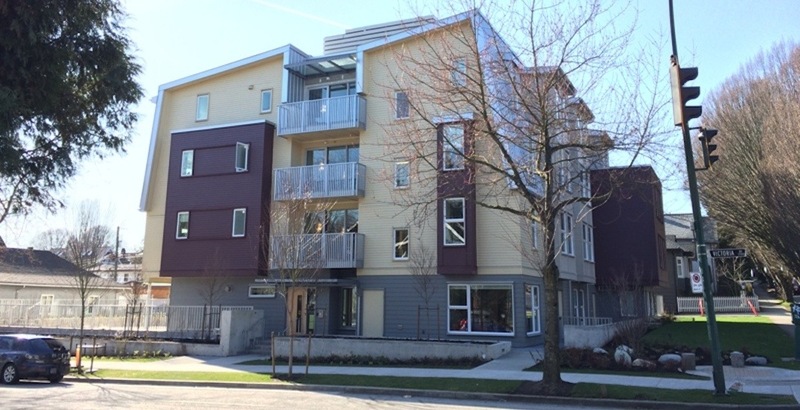 Co:Here Housing Community is located within a newly-built, four-storey building at 1723 Victoria Drive – the southwest corner of the intersection of East 1st Avenue and Victoria Drive. It has 18 homes for people who are homeless or are at risk of homelessness and eight homes for low-to-moderate income individuals, couples, and families. The affordable rental housing development is being managed by not-for-profit housing operator Salsbury Community Society (SCS). The unit mix is 18 studio apartments, four one-bedroom apartments, and four two-bedroom apartments. “The opportunity to operate a building that has been thoughtfully designed to foster community is a gift that is already bearing much fruit amongst Co:Here residents,” said Rebecca Pousette with SCS in a statement. The rezoning application by NSDA Architects, on behalf of Grandview Calvary Baptist Church, was approved by the City of Vancouver in 2012. Various levels of government and organizations provided the necessary funding required to construct the project, including $3.5 million in joint funding from the federal and provincial governments, $500,000 from the City of Vancouver, and $520,000 from Streetohome Foundation. Co:Here Foundation raised the remaining $4.8 million from its private fundraising efforts, and the church provided the land valued at approximately $2.68 million.